Chapter 1 outlines the problem statement, objective and scope of work. The background of the study area is described in Chapter 2. This chapter presents the location, topography, climate and landuse of the study area. Chapter 3 reviews previous studies carried out in the study area by other consultants. Chapter 4 reports the data collection works being carried out to acquire the data. Chapter 5 describes the existing drainage system. 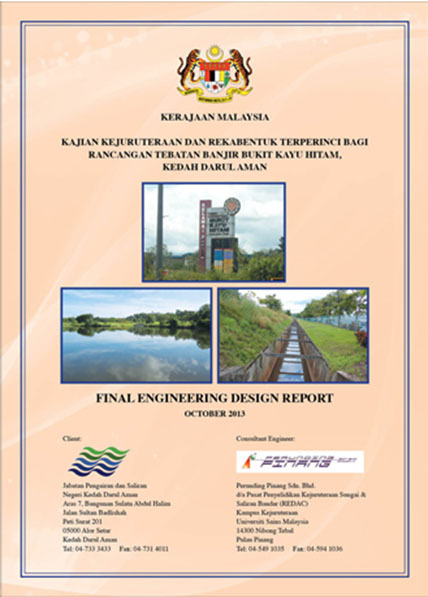 This chapter highlights the present condition and the evaluation of the existing drainage system in the study area. Chapter 6 gives the stormwater management concept of MSMA, which will be adopted in the study and detail design. Chapter 7 consists of the outline of stormwater management and flood mitigation plan. Chapter 8 explains the methodology and processes of hydrological and hydraulic analysis and modeling. Chapter 9 delineates the project scheduling and costing for all proposed flood mitigation components. Appendix A is the terms of reference, Appendix B is the inventory form, Appendix C is the tender drawing and Appendix D is the cost estimation of this study. Bandar Bukit Kayu Hitam is Kedah's main border town on the Malaysia-Thailand Border. It is managed under the jurisdiction of Majlis Daerah Kubang Pasu (MDKP). The Department of Irrigation and Drainage, Kedah (DID Kedah) had receives many reports and complaints from local residents and industrial investors due to the flash flood problems. Flooding frequently occurs since year 2006 and the latest occurred on 7th March 2012. A total rainfall depth of 168 mm over a 2 hours period has been recorded at Bukit Kayu Hitam Rainfall Station (MADA’s Station) for this event. It involves the upstream area of the catchment which includes Black Forest Golf & Country Club and its surrounding area. DID Kedah suspected that the overflow from the detention pond located inside golf club cannot cater to the peak flow from the rainfall event, hence cause flooding further downstream. As a consequence, this area is rather flood prone especially during heavy downpour. 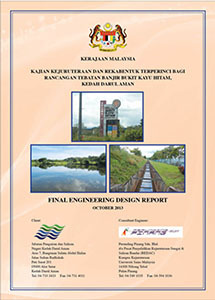 In order to solve the flooding issue, DID Kedah requires the service of an established consultant who is familiar with stormwater design in Malaysia using the Urban Stormwater Management Manual for Malaysia (MSMA) by the Department of Irrigation and Drainage (DID) Malaysia, to conduct feasibility study and subsequently produce the mitigation plan to overcome the problem. It is on such approaches that The Department of Irrigation and Drainage, Kedah (DID Kedah) is inviting Perunding Pinang Sdn. Bhd. (hereafter refers to as the consultant) to prepare Kajian Kejuruteraan dan Rekabentuk Terperinci Bagi Rancangan Tebatan Banjir, Bukit Kayu Hitam, Kedah Darul Aman. This four month study was awarded on 1st October 2012.
iv. To construct stormwater collection and conveyance systems from a catchment to its receiving waters that curtail minimal impact to the surrounding areas by managing and improving the quality of stormwater runoff from urbanized catchment and its pollution loads in order to reduce the adverse effects of non-point source contamination on the receiving water environment and by eliminate point source pollutions discharges where possible to stormwater systems and receiving water in order to reduce the adverse effects of point-source contamination.